Sometime last year, social networking giant Facebook launched an online Q&A product called Questions. It was thought to be a feature that would rival Yahoo! Answers or the much buzzed-about Quora – in that Facebook Questions would be a similar online database of knowledge, built by hundreds of millions of users – but the product eventually failed to gain traction. Few people used it. 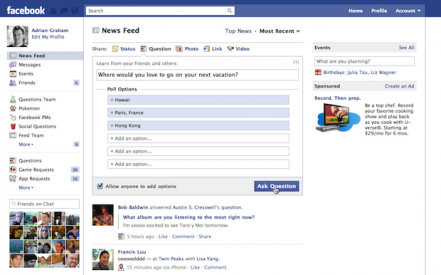 Now, Facebook Questions has been revamped and made more “social”. It’s probably less ambitious than its first version, but it’s certainly better and more useful this time. 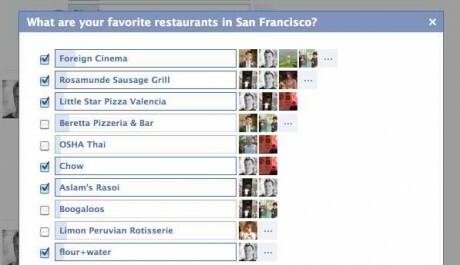 The new Facebook Questions is meant not so much as a knowledge database as a social recommendation engine, one that makes it easier to ask – and answer – questions. Once activated, the feature shows up at the top of a user’s News Feed and Profile pages as a share option, similar to that for posting status updates, photos, links, and videos. When a user asks a question, it shows up as a poll in his or her friends’ own News Feeds, complete with bulleted answer choices that friends – and friends’ friends – can vote on. (If someone wants to add an answer that isn’t already listed, he or she can add a new one.) Users also have the option of adding photos to their questions. Once a question is answered by a Facebook user, it shows up in the News Feeds of that user’s friends. This – along with a “Follow” option that allows anyone to receive notifications about questions that interest them – adds to the huge viral potential of the new Facebook Questions. Unlike the earlier version of Facebook Questions, the new one doesn’t allow free-form answers; content, moreover, can no longer be browsed by topic. Because Facebook is making Questions available to personal users as well as to Facebook Pages owners, the feature presents a new opportunity for businesses and brand managers to leverage this social question-and-answer product as a tool for market research, crowdsourcing, customer service and support, and social media marketing. When a Facebook Page owner asks a question, it will be shared across the News Feeds of users who liked the page. What should our flavor of the week be? Which organization would you like to see benefit from our upcoming charity event / program? Who do you want to see interviewed in our next show / video / podcast / blog entry? Which fashion items are you most likely to shop for this season? And so on and so forth. Questions, of course, would depend on your industry and type of business. But one thing is clear: the revamped Facebook Questions adds yet another dimension to the amazing social media and Internet marketing possibilities available on the social network. The issue marketers are going to face is getting their post into their fan’s newsfeed. Facebook made a subtle change to Fans newsfeed a few weeks ago; basically the newsfeed default only shows posts by friends or pages with whom the fan interacts most frequently. For most brands, this means the fan base we’ve worked so hard to cultivate no longer sees our posts (at all!) unless they were a very active participant of the brand’s page. So…asserting that the Questions tool will result in content appearing in a fan’s newsfeed is a bit misleading. Facebook’s tweak to the newsfeed means most fans of a brand page will never see a questions post or any other content that’s published by a page owner.